Lip Sync Battle is a popular show on Paramount Network where famous people face off against each other lip-syncing popular songs from today and yesterday. It's a great theme for a party, regardless of the occasion! Of course, the actual lip syncing itself is going to be the highlight of the event. You can go about this activity in a number of ways, depending on your group's preferences. Let each person pick out two songs. Give them 10 minutes or so of practice for both. For the first song, the contestant will just lip sync the words along with making gestures and following some dance moves. Between the first and second round, let the contestants pick out some costumes from a costume trunk or closet. Then, they perform their second song in costume with even more exaggerated moves and dances. Let the rest of the guests pick the winner by cheering for each; whoever gets the loudest cheers is the winner. Have a list of songs by groups (boy bands, rock bands, girl groups, etc.) ready for each team to choose from for their lip sync session. Set some ground rules, like each person must participate in some way (no standing in the back!). Give the teams about 10 to 15 minutes to practice. Play the songs for each team and allow them to perform the lip sync routine they created. 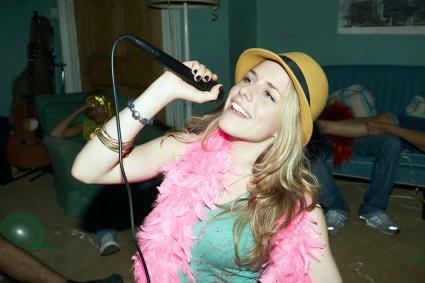 If everyone is into it, you could continue to a second round with coordinated costumes or just stick to one song. Let the judge select the winner. 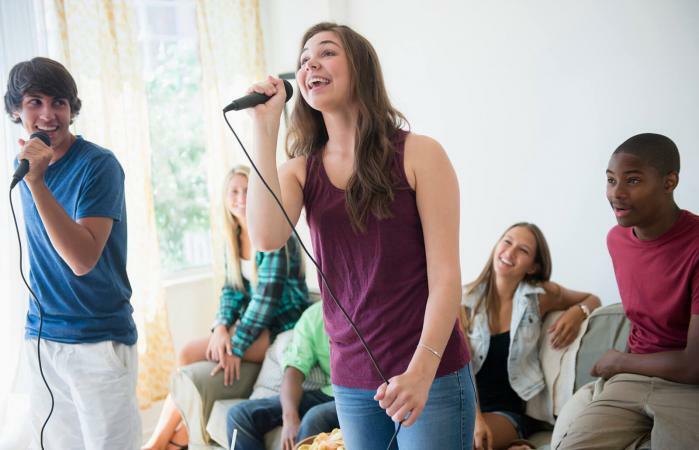 If your group of friends or party guests is into music, it's likely they also know some great moves for a variety of songs. Take the lip sync competition to the next level by adding an original dance routine component to the battle. Have a great list of group club dances for selection. Let each team (or person or duo) pick out their favorite song. Give them about 20 minutes to rehearse a dance routine to go along with the lip syncing. Have the appointed judge(s) determine the winner after both teams have competed. Put song suggestions in a hat, jar, or bowl. Flip a coin to see who gets to draw out the suggestion. Whatever song is drawn is the one that both sides will use for their lip sync battle. The person/group who didn't win the coin toss gets to decide who goes first. Each person/team alternates verses and they all lip sync the chorus. For additional drama in this battle, have teams face one another as they sing. A fun spin would to have only the best angry songs available for selection, making this a true "battle" among friends! Prepare a list of the best songs from a variety of genres. Divide people into teams of five or so people. You can have as many teams as you want. Set up a stereo system with WiFi connected headphones. Each team should get headphones. The selected player on each team should don the headphones. Set the stereo or your phone (or whatever medium you're using) so the larger speakers are off and music only goes through headphones. Once the song starts, the players will lip sync the song. The first team to guess the song being lip synced gets a point. Play until one team reaches five (or whatever number of points you select). Making a stage - Outside, a patio or deck can serve as the perfect natural stage. Inside, set up a dropcloth with a sheet, blanket, or streamers as the backdrop to designate a stage area. You could also purchase a plain paper backdrop and flank it with curtains. Have a faux microphone with stand on hand to use. Lighting techniques - Lighting is a key component of a musical performance. Hang twinkling rope strand lights around the room's perimeter. Add a multi-colored spotlight pointed at the stage. Ceiling decorations - Hang a small disco ball above the stage. Add a few metallic spinners above the food and seating areas. 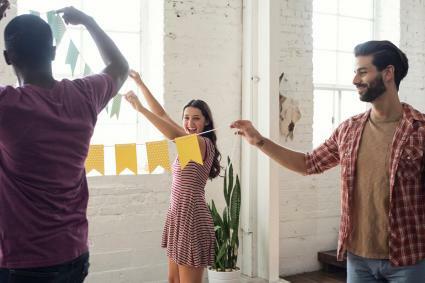 Get everyone to your party by selecting invitations that feature karaoke machines, music notes, or even a vintage record. Set up a party food buffet and label each food with a riff on a popular song. The battle may be the focus of the event, but the details will help bring it all together.